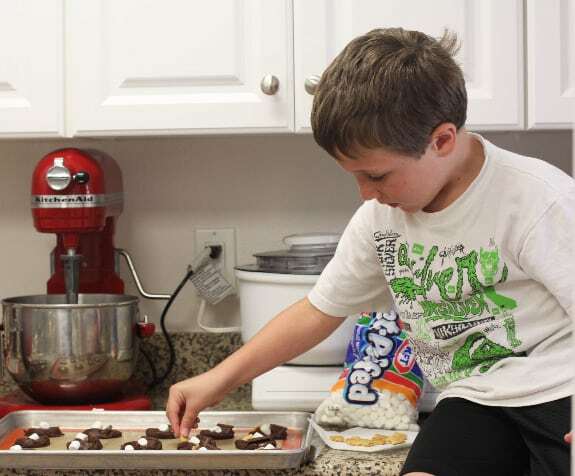 For now, go grab the kids and whip up a batch of these killer cookies. Last Sunday afternoon the boys and I made these cookies together, we devoured these so fast! I didn’t plan on posting the recipe because they are so simple, but after one bite I knew I had to share. 1. Preheat oven to 350 degrees F. In a large bowl mix the cake mix, eggs, brown sugar and butter until combined. With a medium cookie scoop, scoop dough onto a silpat or parchment lined baking sheet. Press cookies into little discs to flatten slightly. 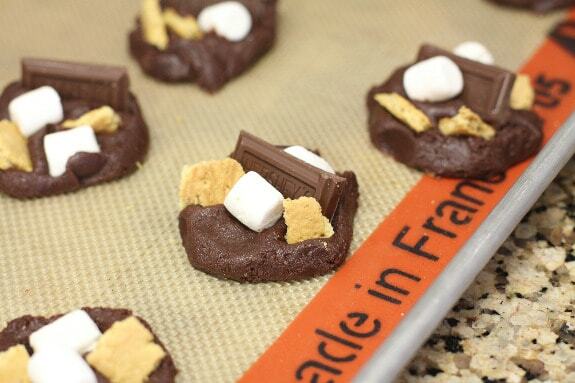 On each cookie press a chocolate bar, a couple marshmallows and a couple graham cracker pieces. Bake for 11-13 minutes or until cooked through. 2. Remove and let cool on baking sheet for 5 minutes before transferring to a cooling rack. Serve with milk and enjoy! I made you chocolate chip smores cookies last weekend for a going away party. They were a HUGE hit! Can’t wait to try these! Thanks! GENIUS. i can’t wait to make these immediately! How can these not be amazingly delicious!? S’mores in the title? 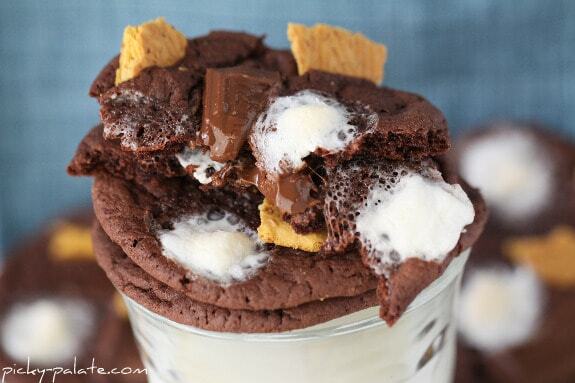 Graham crackers, marshmallows and Hersheys on top of each cookie? We’re so sold. I really need to stop reading your blog at 7am. Before I read it, I’m content with a bowl of Cheerios…afterwards, I’m craving cookies, cakes, and chocolate chip pancakes. I love these! Great trick using boxed caked mix. I’ll use this recipe when I need something QUICK! Does it have to be a Devil’s Food cake mix or could I use any chocolate cake mix? They look so good I want to try them and I have a milk chocolate cake mix in the cupboard. Such a cute idea. They look delicious! I know your boys LOVED making these! And I know they were some kind of GOOD! Your home must stay smellin’ so sweet! Have a FAB time in NYC! I assume this means you are going to be at BlogHer! Hope to meet you there! Who can say no to marshmallows and chocolate? I will have to give these a try very soon! These look amazing! We made s’mores a few nights in a row this week. These look like so much fun, we’ll have to try them. What a great idea! I bet they were delicious! Love it!! Such a fun idea and recipe! thank goodness for my program http://bit.ly/amFvSr !! 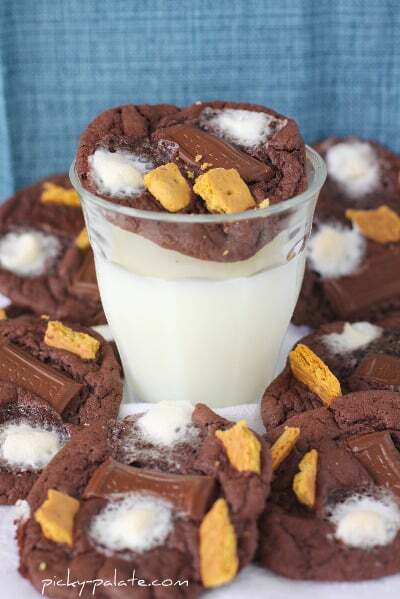 I love cookies and these look fabulous!! I can eat them without feeling guilty! ooh. looks yummy! is it a cakey cookie or more like a cookie cookie? Love that we don’t even need a mixer for these treats! Fun seeing the boys help mom in the kitchen. Are they having a great summer or what!! These look amazing, and so simple to make! Have fun at BlogHer in NYC! 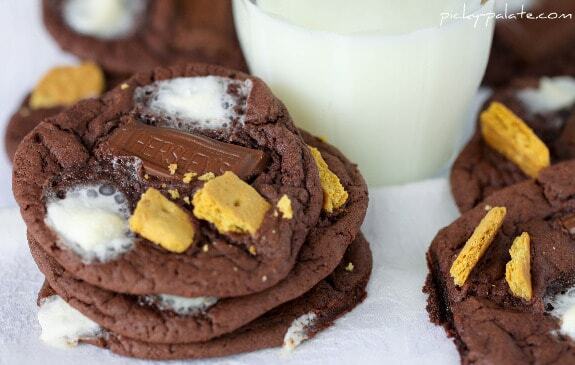 These cookies look so naughty and wonderful! I’m seriously drooling! I don’t generally get too carried away with cookies, but I could have eaten one right after the other! Sooo yummy! Yum! My son would love this, cant wait to try this soon! My kids love smores and would love being able to have these treats even when we are not by a fire. These look wonderful. Great pics! Whenever I visit your blog, I always feel like you’re trying to fatten me up, haha. There’s no way I can resist these! 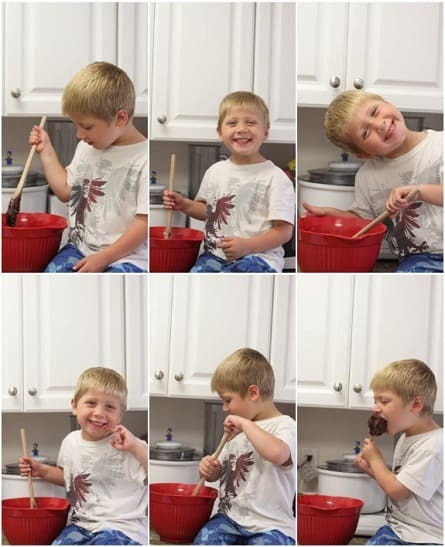 Such cute photos and I bet everyone had a great time making these cookies! When I have my kitchen back I am making these! These are so beautiful! I think I’ll make these for a birthday next week and turn them into ice cream sandwiches. Oh my goodness…these look awesome! There really aren’t words to describe how amazing these look!!!! What a treat these would be. No wonder your son looks so happy! 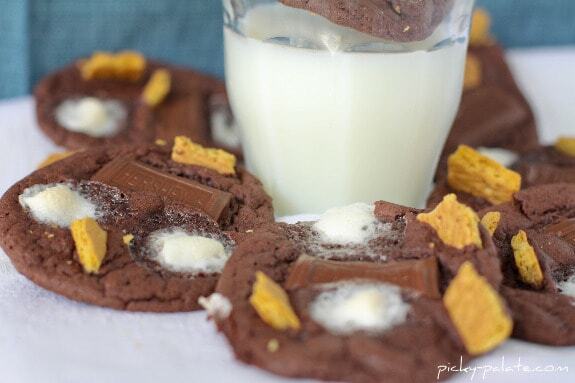 My husband’s favorite treat is a s’more, so we’ll definitely be trying these out. I featured you here! 8. I found your blog via engine search and as I study them although, I was stunned by the phrases you are choosing from. It really affects my personal views in life. I just tried this recipe today and it was so quick and simple. I used my muffin top pans and the cookies came out perfectly. Thank you for this wonderful recipe! Glad to hear the cookies were a success! WE love that recipe! Thank you for the awesome (and easy!!) recipe! These are delicious and so easy to make! Thanks so much!